We give you our model couple Kristen and Aric! Aren’t they adorable?! Kristen and I go way back from working together in retail, to finding our passion in photography, to now her being engaged to this cutie named Aric which means….We get to now be their wedding photographers! 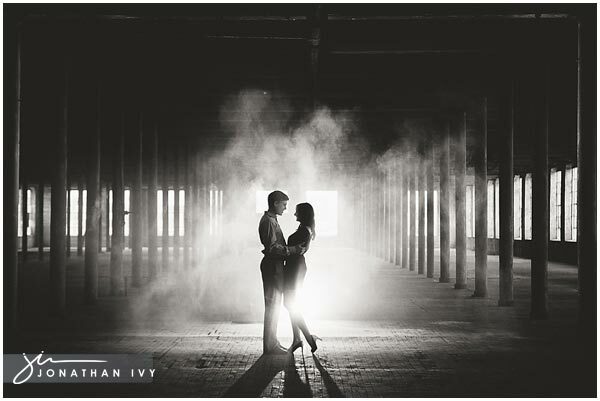 So we headed out to one of the best places in the DFW area for beautiful rustic photos, the McKinney Cotton Mill. We only spent a couple of hours there and came away with WAY too many beautiful photos. So here are just a few of my favorites for you all to check out. We always like to mix it up a bit doing some black and white and some photos in color. These 2 photos shown here are absolutely killer in B&W. We often get the question: “Can you shoot cool silhouette photos?” Well here you go, the answer is yes! Aric, here is your negative space image. We love little series photos like the ones above. Kristen and Aric went along beautifully allowing Jonathan to play with all sorts of things. So far, they were all a success creating cool, killer images! They even brought their furr baby along, Saydee. She and Jonathan finally bonded…some. I LOVE the image above!